Under longstanding National Labor Relations Board (NLRB) precedent, witness statements obtained by an employer during an investigation of employee misconduct have been considered confidential and were not required to be produced to the union that represented an employee in a grievance. In holding that employers were not required to turn over confidential witness statements to union representatives, the Board reasoned that witness statements were fundamentally different from other types of information since their release carried a risk of potential witness intimidation and increased the likelihood witnesses would be reluctant to give statements without assurance from their employer they would be kept confidential See Anheuser-Busch Inc., 237 NLRB 982 (1978). However, in American Baptist Homes of the West d/b/a Piedmont Gardens, 362 NLRB 139 (June 26, 2015), the NLRB overruled Anheuser-Busch and held that witness statements obtained during an employer investigation were no longer exempt from production to union representatives. Instead, the Board indicated that the Detroit Edison v. NLRB, 440 U.S. 301 (1979), balancing test should be used for all future matters involving confidential witness statements. The balancing test adopted by the Board in Piedmont Gardens requires that employers conduct a fact-specific analysis that balances a union’s need for the information against the employer’s legitimate and substantial confidentiality interests. Under Piedmont Garden, if an employer seeks to challenge the production of a witness’ statements in connection with an employer investigation then it must raise its confidentiality concerns to the union in a timely manner and offer the union an accommodation. Possible accommodations may include asking the union to enter into a non-disclosure agreement, redacting the witness’ names from statements or producing a list of witness names with a summary of the information obtained without attributing the information to any particular witness. Whether a particular accommodation is appropriate will depend on the facts and circumstances of each case. The proposed accommodation will be subject to good faith negotiation with the union. If the accommodation is rejected and the union files an unfair labor practice complaint, then the employer will need to demonstrate, it has a “legitimate and substantial” confidentiality interest in the statements. In order to establish it has a “legitimate and substantial” confidentiality interest in the statements, the employer will need show, on a case-by-case basis, that the witness needs protection, evidence is in danger of being destroyed, testimony is in danger of being fabricated or there is a need to prevent a cover-up, and that such interest outweighs the union’s need for the statements. If an employer is able to make this showing, then the employer may lawfully refuse to disclose a witness’ statement. 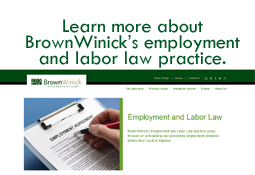 The Piedmont Gardens decision does not impact the work product doctrine, which may still be raised to object to a union’s request for witness statements where such witness statements were obtained in anticipation of litigation or for trial. Employers should seek the advice of counsel before withholding witness statements or other potentially relevant information from union representatives on confidentiality grounds.